This is not quite stuffing and not quite risotto. Barley makes is crunchier than risotto or stuffing. The original Cooking Light recipe calls for adding liquid 1 cup at a time. Changes were in order. I went for the dump-and-stir method, adjusted a few things and got good results. One thing to keep in mind is that this recipe makes A Lot of Barley. It also tastes better after the second day after the flavors have had a chance to be friends. Definitely a side-dish kind of food item. And it works surprisingly well as a Loco Moco starch. Teenager approved. Cook bacon til crispy in a Dutch oven. Remove and drain on a paper towel, then add the onion, garlic and thyme, plus a little Hawaiian salt. Cook until the onion soft and almost ready to caramelize. Dump in the mushrooms until browned. Add the barley and stir it around until all elements are mixed together and well-coated. Add the spinach and cook until wilted. This will be fast, a few minutes. Pour in all the broth and stir to a very slight boil. Stir until almost all the liquid is absorbed. At the very end, add the shoyu, sun-dried tomatoes, bacon and about two handfuls of cheese. Mix until just combined. Toss everything into a 9 x 13" or similar pyrex pan that you have sprayed with Pam. Sprinkle the rest of the cheese on top. Bake at 375 degrees for about 15 minutes, when the cheese starts to get bubbly. 1) Makes a good leftover. 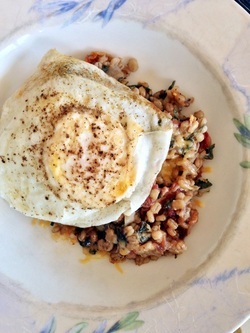 3) I also skipped an additional 3 cups of water because the fresh spinach releases quite a bit of liquid, and I like the barley to be a little on the crunchy side. If it's too crunchy, you can add a bit of water as you go along.